DASIA has formally been executed as a yearly conference since 1996, with yearly predecessors back to 1990. It embraces technical and managerial aspects of development, operation and maintenance of data-handling related components and systems. It encompasses hardware and software for space and aircraft systems or systems for other sectors sharing similar requirements for high reliability and complexity. Cross-domain topics and participation have a high priority at DASIA with other domains including e. g. transport, communications, navigation, energy, remote sensing, robotics and automation. DASIA is a 3 days conference with 2 tracks covering 60-70 presentations followed by Q&A’s. The presentations are mainly based on paticipants abstracts selected from an open invitation where the contents of the selected abstracts determines the topics of the individual sessions. In addition it includes keyote presentations and workshops/panels in plenum, with contributions from invited people and from the participants that have signed for the conference. Companies, agencies and institutions exhibit their products next to the conference rooms, at the latest conferences up to 13 exhibitors. DASIA participants are traditionally mainly coming from the space industry sector including SME’s, from space agencies including in particular ESA, from universities and from institutes. They mainly come from Europe but the participation is open to the world with participants coming from e.g. USA, Canada, Russia, Israel, the Emirates, Japan, Korea, or Australia. The DASIA conference is placed late May or early June and normally at a new location each year. The 23 editions were successively organized in Rome, Seville, Athens, Lisbon, Montreal, Nice, Dublin, Prague, Nice, Edinburgh, Berlin, Naples, Palma de Majorca, Istanbul, Budapest, Malta, Dubrovnik, Porto, Warsaw, Barcelona, Tallinn, Gothenburg and Oxford. 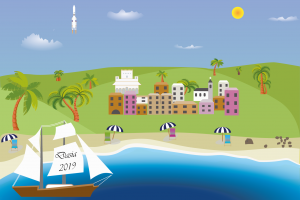 DASIA 2019 will be held in the Spanish Costa del Sol in the period 4 th to the 6 th of june. DASIA 2019 will be held Torremolinos (Málaga) at the Spanish Costa del Sol from June 4th to June 6th. DASIA 2018 was held in Oxford United Kingdom, from May 29th to May 31st at the Macdonald Randolph Hotel. At the beginning of each year Eurospace organises with Business Bridge Europe the annual European space policy conference. This annual events brings together high profile speakers from the space institutions and the private sector to address the key policy challenges ahead. It is one of the most important space policy events in Europe. In 2017 (January 26-27) was held the 9th conference: “Space Strategy for Europe: The Road Ahead”. Representatives from the European space sector gathered in Lausanne on April 26-27 2016 for the Eurospace Research, Technology and Development Workshop 2016 to discuss key RDT priorities for space and share the vision for a coordinated, ambitious and sustainable technology strategy for space. · Support risk mitigation in key areas where security of supply is at stake. This vision was shared and discussed by industrial and institutional stakeholders, highlighting the many points of convergence in the sector. 2. The discussion on key RDT trends comes at a turning point of the evolution of European space policy, with the ESA ministerial Council at the end of the year together with the preparation of EU’s H2020 roadmap to 2020 and the definition of the new Space strategy for the Union. 3. Member of Parliament, Mr Marinescu, reaffirmed his commitment to work towards more extensive and better use of space. Space programmes and space research shall be a key topic for inclusion in the upcoming discussions on the new MFF. 4. European Commission highlighted its unfailing commitment to space programmes, with a view to further such essential initiatives as Galileo and Copernicus, and aiming at supporting technology development in key areas within H2020. European Commission also highlighted the importance of supporting service development and efficient exploitation of Space infrastructures for the creation of added value from space programmes. 5. There is also a lot of room for the expression of national interests in technology policies, with national space strategies being elaborated with the support of complex political and technological toolboxes paving the way to the consolidation of various stakeholder’s views. National strategies need to strike the appropriate balance between the focused development of national capabilities, and the achievement of a competitive industry within a European and global environment. 6. Participants acknowledged how much technology is a driving force for the space sector; technology policies and programmes shall ensure readiness for the right technologies, at the right moment. It is critical to bridge not only the maturity gap, but also the gap to the final users in order to ensure availability of the right technologies, at the right time for the right application supporting a product or a service. 1. RDT Policy is a key enabler to European Space programmes, it is the stepping stone giving shape to industrial capabilities and providing the foundations for space to remain accessible to Europe. The RDT policy shall support the key objectives for ensuring European access to space to all missions and programmes, and maintaining an efficient, competitive and non-dependent industrial base. 2. Today, after decades of consistent public investment, European industry has achieved enviable positions on the global market. Space is one of the European areas of technological excellence. But the global space paradigm is changing, and European positions on the global space arena need to be preserved. The growing competition from China, and the new space business models pioneered in the USA require specific attention. 3. The European Space industry is competitive, but competitiveness needs to be permanently re-assessed with respect to the achievements of the competition. Support to industry competitiveness is a concern shared by all institutions in the space sector, and it is a core driver for technology policies and strategies. Eurospace promotes the setting up of a consistent and coordinated dialogue with industry to meet the core needs and trends, relying on the European space governance to take advantage of it. 4. Eurospace presented a complete roadmap of technology developments, highlighting critical needs not yet addressed by the European technology plans. The sector aims at achieving unrestricted access to the state of the art in all technology domains to serve institutional and global costumers. Technology readiness for risk mitigation remains a core concern, whereas bringing technology to the appropriate maturity levels is a mandatory requirement. Notwithstanding, programmes aiming at higher TRL (6 and above), including in-orbit validation opportunities, are still very scarce. 5. In technology programmes time is of the essence, to bring products to the market in line with global competition. This requires a careful selection of priorities and the effective roll-out of appropriate processes and tools. Today these are still not sufficiently addressed in technology programmes. 6. European space RDT policy shall take stock of European space sector needs. It shall ensure the good alignment of budgets and priorities, through permanent exchange with industry and users, ensuring that technologies are brought to the appropriate maturity level for their good adoption by users and the creation of added value. A Europe wide technology policy shall consistently aim at the proper coordination of national, ESA, and EU development programmes, avoiding unnecessary duplication and ensuring that critical objectives are met: readiness, time-to-market, maturity, non dependence, efficiency.